Melbourne four-piece Buried Feather take a trip through kosmische, drone and classic psychedelia on their second full-length Mind of the Swarm, released locally through Cobra Snake Necktie Records. 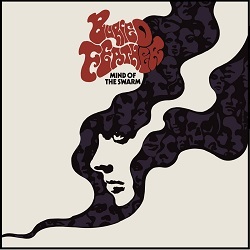 Mind of the Swarm bears many of the hallmarks of psych rock – swirling keyboard sounds, vocals buried in reverb and vibrato and tremolo for days – the nine tracks here never fall back on tired tropes. There’s more groove here than you might expect from a straight-ahead psych band, and a pop smarts underneath the fuzz and wail that makes for a more cohesive set of songs than on Buried Feather. It’s been a while since that eponymous debut, but clearly time well spent. This a quantum leap for the band, and yet another example of the fine psychedelia that has spread like ergot fungus through Melbourne’s underground in recent times. Listen loud. 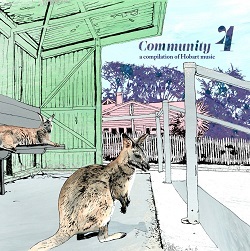 Community 4 – A Compilation of Hobart Music, is a collection of singles from various local bands. For the first time in the series compilation, all songs were written and recorded at the Hobart Underground Community Centre – a place purpose-built to provide musicians with a physical space to be a community and to create work. The series started in 2010 as a proclamation of love to the often-overlooked music scene in the south. Owner of Rough Skies Records and known voice of the Hobart music community, Julian Teakle is the brain behind the series. The project began from a desire to permanently document a culture that doesn’t seem to get widespread attention from the indie-music echo chamber that exists on the mainland. Since it’s humble beginnings seven years ago, it is now celebrating its fourth release in the series. Community 4 spans from the post-punk and new wave rumblings of EWAH and The Vision Of Paradise to the indie pop sweetness of Foxy Morons and Filthy Little Star. It offers the sparsely worded storytelling, guitar infused sound (that Australia seems to be so captivated by) with The Pits, and closes with some experimental electronic sounds from Andie Laureson. The compilation explores the experience of living in isolation, experiences of being in-between and otherness. The record strings together the gems of the south and offers a reminder that the isolated, often undermined music community of the Hobart is thriving. In a place that is often disrupted by musicians migrating to the big smoke, this compilation acts as a living archive of the sounds of the underground music scene in Hobart in 2017.